If you’re running an online store, eCommerce lead generation is a crucial part of creating a successful business. That’s because one of the secrets to getting more sales is to get more leads. After all, today’s leads are tomorrow’s customers. But there are a couple of questions that every eCommerce retailer asks at some point about lead generation. How do you get those potential eCommerce sales leads to your website? And what do you do with them when they land there? We get it. It’s not always easy to know how to generate leads for an ecommerce website to boost sales. So we want to help. We’ve collected the best eCommerce lead generation tips around to help you turn your website into a lead generation machine that’ll keep the leads – and the sales – rolling in. We promise; these tips are easy to implement so you can start earning revenue fast. Ready to check them out? Use this table of contents to jump to the eCommerce lead generation tip you’d like to use first. Before we get into the strategies for generating eCommerce leads, let’s discuss what a lead is, and how you work out who your own leads are. If you already know this, feel free to skip ahead to the first tip. If you’re using OptinMonster, you can easily measure these actions, which are called conversions, in our conversion analytics dashboard. As with all marketing, eCommerce lead generation strategies rely on knowing who your audience are and where to find them. We’ll look at that in the next section. Working out who your leads are is a two-pronged process. 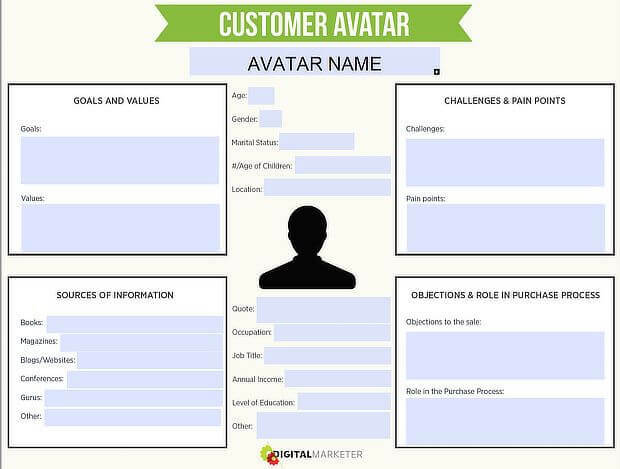 First, figure out who you want to attract as customers and define customer avatars or buyer personas for them. The second part of lead generation for eCommerce is to figure out where your ideal customers hang out online. 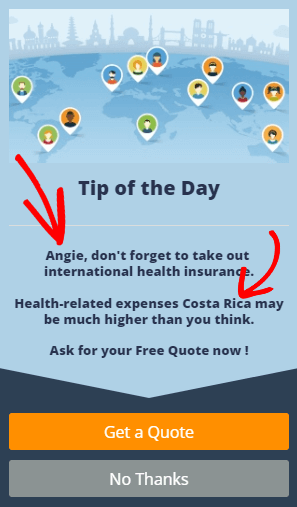 That’ll help you target your marketing. If your existing web traffic is converting well, you can easily see where they’re coming from using Google Analytics. 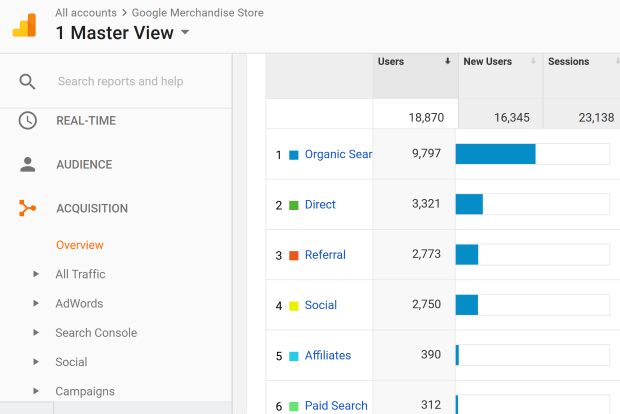 To get started, log in to Google Analytics and go to Acquisition » Overview and you’ll see a chart with the top ways your visitors find your site. Scroll down a bit, and you’ll see links for the different traffic sources. Click on any of them for more detail. For example, Referral will show you the sites that have brought traffic to you. And Social will show the top social networks visitors use to find you. Social networks tend to be an important referral source. Once you know what those networks are, you can check out the social analytics on the different platforms to learn even more about your potential leads. For example, Adobe was able to double lead conversions with demographic information from Twitter. Remember that traffic itself isn’t the most important metric. You want to make sure you’re identifying which traffic sources generate the most revenue, so you can invest your time in tactics that are already proven to work for your store. 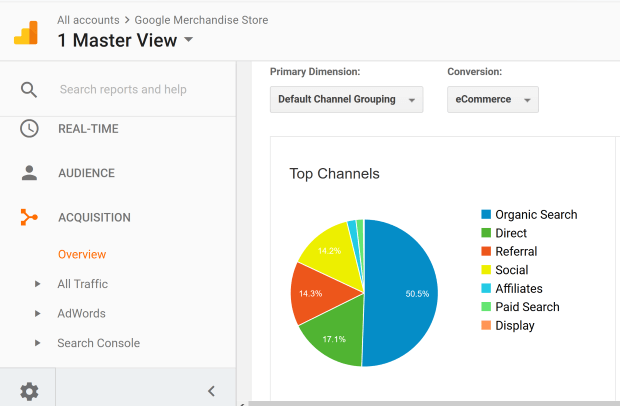 If you’ve enabled eCommerce tracking in your Google Analytics account, you can view your eCommerce conversion rate and revenue alongside your traffic sources. Once you know where your customers are coming from, you’ll know where to focus your efforts to generate leads that convert. So far, so good? Let’s dive into those strategies for generating leads for eCommerce. The best place to start with eCommerce lead generation is setting up an email list. That’s because email marketing is one of the most effective ways to communicate with and nurture leads. The latest email marketing stats show that people still read email, and enjoy getting emails from the businesses they connect with. Emailing prospects a few times a week can be a great way to keep leads coming in. If you’re just starting out, MailChimp can be a good email provider to begin with. That’s because it’s free for up to 2,000 subscribers and 12,000 emails a month. However, if you have a bigger list, or you’re ready to level up, consider Constant Contact, which is also one of the top email marketing services. 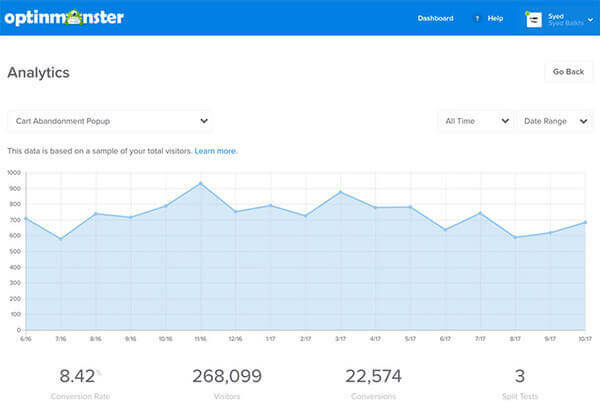 Here’s a guide to help you get started with a simple OptinMonster campaign to grow your email list and start generating eCommerce leads. You know what’s even more effective than a simple email signup campaign? A campaign where there’s a payoff for your customer. When we say a payoff, we mean a lead magnet. That’s a valuable freebie that you give your customers in exchange for an email address. A lead magnet can be a guide, checklist, or ebook, showing customers how to get more from what you offer. 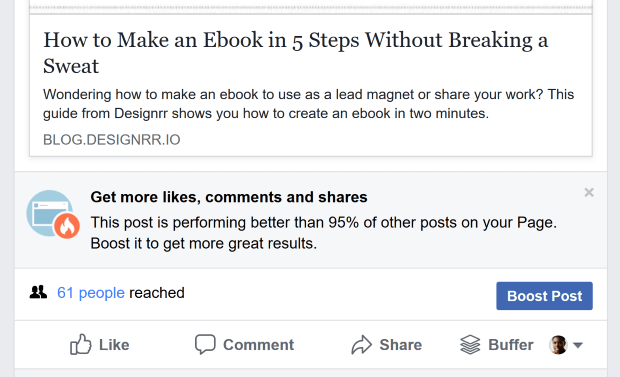 The best lead magnets are simple and easy to understand, and solve a problem for the reader. Plus, they give subscribers the warm fuzzies about you, and can make them want to buy from you, or at least learn more – double win! 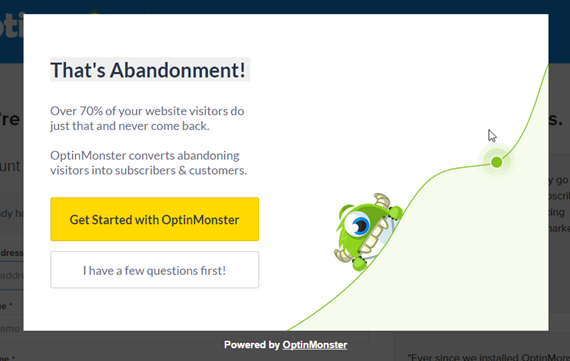 OptinMonster customer LeadFuze was able to 4x conversions by offering both a lead magnet ebook and a webinar. Check out more lead magnet ideas here. You can also learn how to create a lead magnet of your own in our lead magnet blueprint. One way eCommerce sites miss out on leads is by failing to get the attention of visitors planning to leave the site. Believe it or not, this is one of the best times to try to tempt them to sign up. And one of the best ways to achieve that is with OptinMonster’s exit-intent® technology. Our customers have had amazing results with exit-intent® campaigns. To use exit-intent®, follow our instructions for creating your first campaign. Then go to Display Rules » When should the campaign appear? » On Exit-Intent®. Enable the display rule. We use this feature on our own site to encourage visitors to get in touch with us if they have questions. 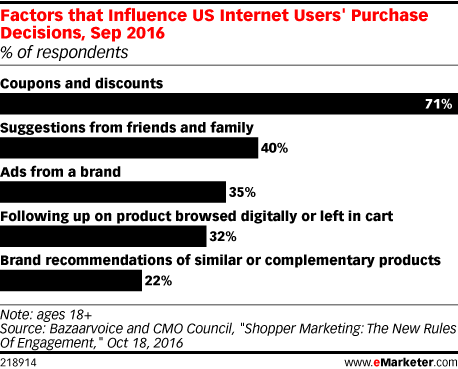 Online shoppers love discounts and coupons. In fact 71% of people say they’ll decide to buy based on a coupon. So if you offer one as an incentive for subscribing to your list, most people are going to be interested. This is easy to do with OptinMonster. Once you’ve set up your marketing campaign, you can deliver the coupon via a success theme, or send it by email. See our list of eCommerce email examples for inspiration. 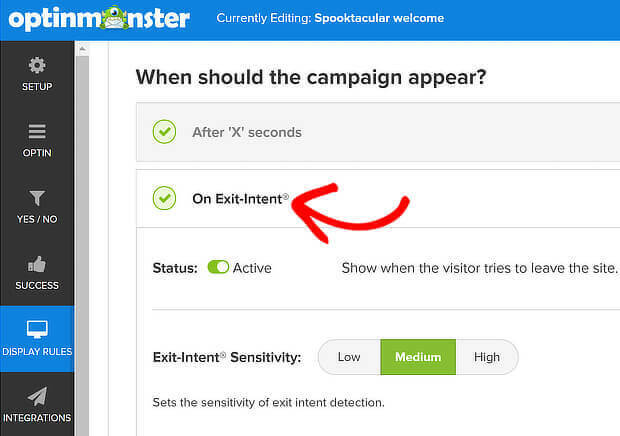 Go to Success in the OptinMonster campaign builder to enable this feature. You can also redirect them to a page where they can apply the coupon immediately. That way you don’t just get leads; you make sales, too. 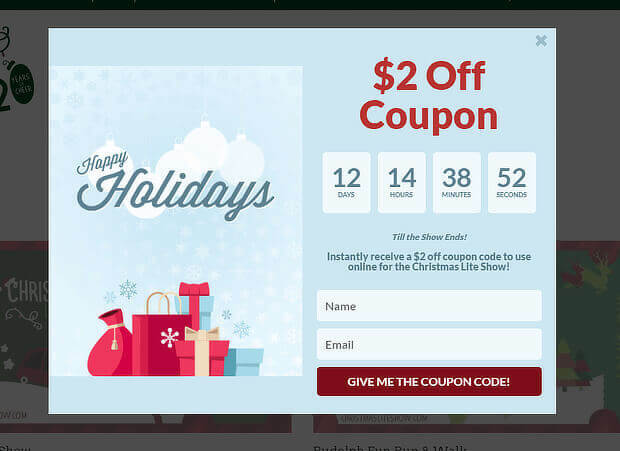 Learn more in our guide to creating a popup coupon. When a lead generation offer is about to run out, it suddenly gets more appealing. We want it more, because that’s the way we’re wired. Using urgency and the fear of missing out (FOMO) as eCommerce lead generation strategies is practically guaranteed to pay off. You can use both urgency and FOMO with OptinMonster’s countdown timer feature. Christmas Lite Show used OptinMonster’s holiday theme, which has a built in timer, to get names and emails from 16.9% of abandoning visitors. 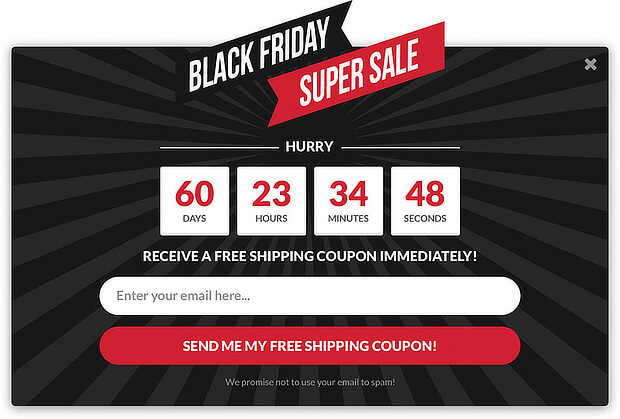 Here’s how you can create a countdown popup to boost leads and sales. Learn more about writing great CTAs in our guide. If you’re selling a SaaS product, then here’s another eCommerce lead generation tip: offer a free trial. According to Totango, 62% of companies get 10% of their business or more from free trials. And 16% of companies get 50% of their business or more. So free trial marketing definitely works. You can use OptinMonster to promote your free trial. 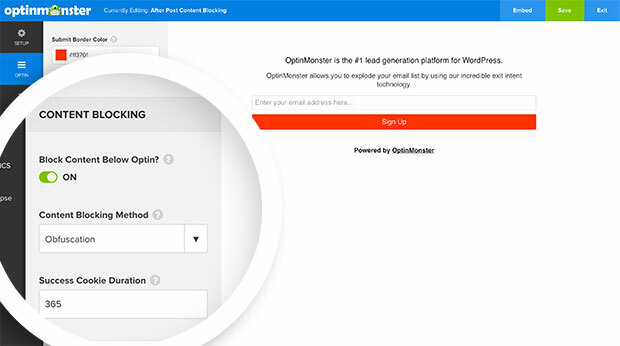 AtHoc combined our MonsterLinks™ 2-step optins with free demo messaging to increase leads by 141%. 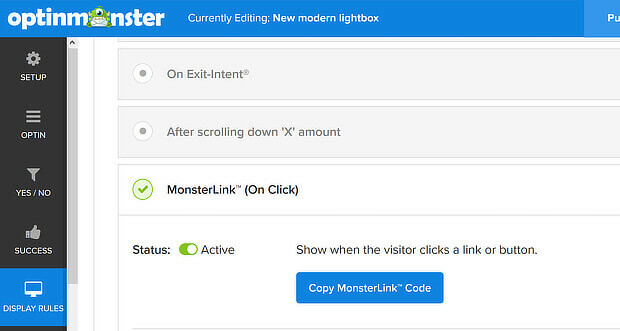 Here’s what you do to make your OptinMonster campaign into a MonsterLink™ so you can share it anywhere, or embed it in your navigation menu. Go to Display Rules » When should the campaign appear? In the OptinMonster campaign builder. Then enable MonsterLink™ (On Click), and grab the link code. Learn more about how you can trigger your popup form with a single click. Search engine optimization (SEO) is an important part of eCommerce lead generation. Most people think of SEO as simply a traffic generation strategy. But if you optimize your content the right way, more of the right people will visit your site. We’ll talk more about guest blogging in a later tip. Learn more about SEO for lead generation in our ultimate guide to SEO. You know what makes visitors want content more? Taking it away. It’s like the FOMO phenomenon we mentioned earlier. That’s why gating your content is such an effective eCommerce lead generation strategy. What do we mean by content gating? Making content less accessible till visitors opt in. This works well for webinars and educational videos, as well as reports, checklists, and cheat sheets. And you can even use it with popular blog posts. 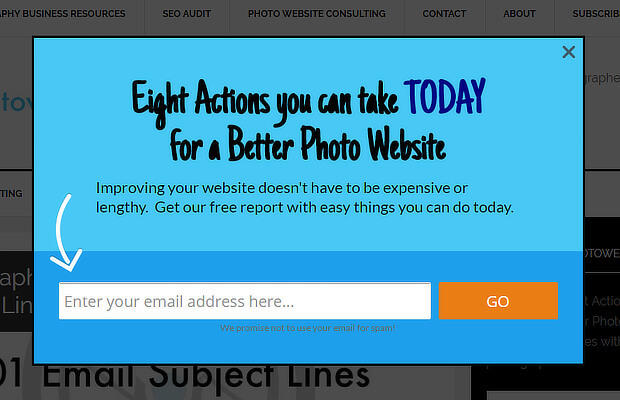 Photowebo boosted conversions by 3806% by using gated content. OptinMonster makes it easy to gate content with our content locker feature. Once you create a campaign, go to Optin » Content Blocking, and choose a blocking method. Here’s how to enable Obfuscation (blurring the content). You can also remove content below the content block. Learn more in our guide to using gated content in marketing. Many visitors will come to your site a couple of times before they decide to grab your lead magnet or get in touch. But if you always make the same offers, that could be a big turnoff. That’s why it’s important to offer something fresh whenever people visit. To use this on your own site, create a campaign, then go to Display Rules » Who should see the campaign? » Visitors who are new vs. returning. Set your campaign to show to returning visitors. When visitors are wavering about your lead generation offer, using live chat can help them decide. In fact, live chat’s also a powerful tool for winning sales. 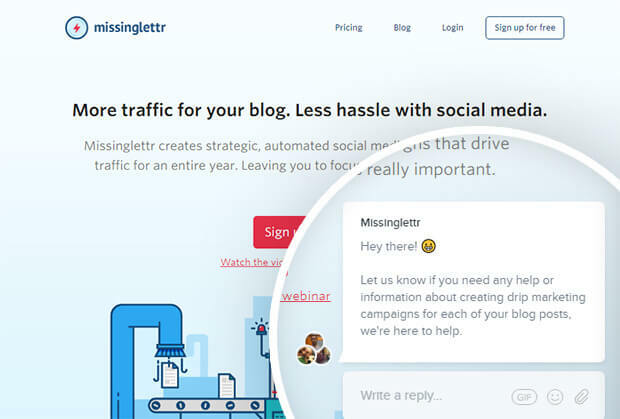 Kissmetrics recorded a 38% increase in conversions for a company using live chat. 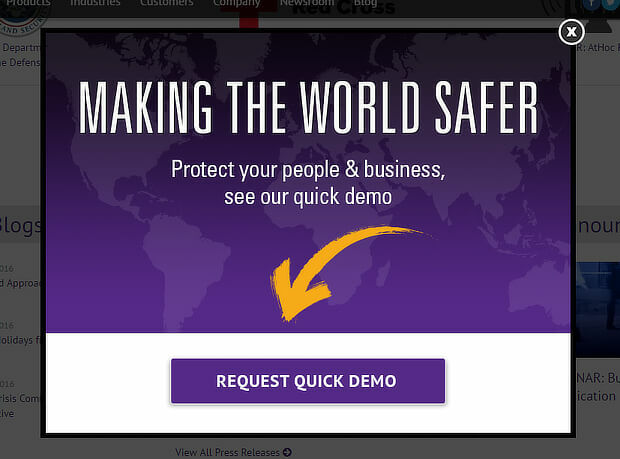 When you use live chat software, you’ll be able to figure out what info visitors really want. Then you can tweak your copy to make it more appealing and convert visitors into leads. Many of the tips we listed earlier will help you improve conversions from your eCommerce site, but there’s one area to pay special attention to for effective eCommerce lead generation: mobile. More people are using mobile devices to research products, services and companies – precisely at the time when they’re most likely to become leads. Google’s research shows a 35% increase in mobile searches for product reviews. There’s also an 80% increase in mobile searches for the “best” products and services – an indication that people are thinking about buying while using their smartphones or tablets. That’s why it’s crucial to make sure your site is mobile-friendly, so visitors can find what they want fast. 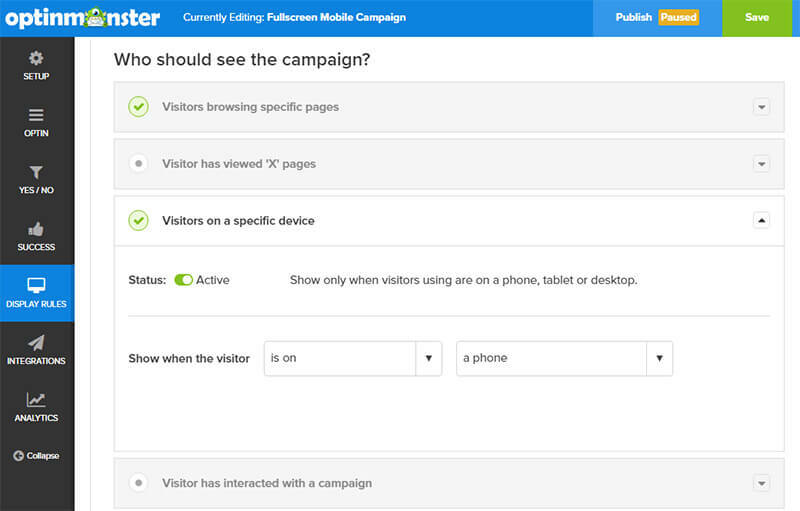 You can use OptinMonster to target specific campaigns to mobile users. When you make a campaign, go to Display Rules » Who should see the campaign? » Visitors on a specific device. Enable the rule to show a campaign specifically to mobile users. This is pretty effective. 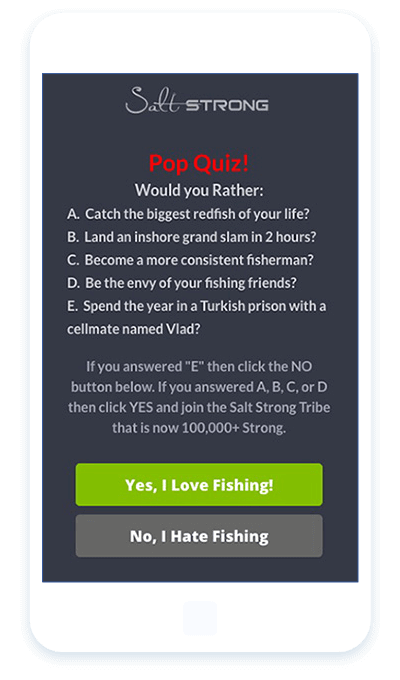 Salt Strong used mobile campaigns to boost conversions 185%. Here’s some more guidance on creating mobile-specific campaigns. 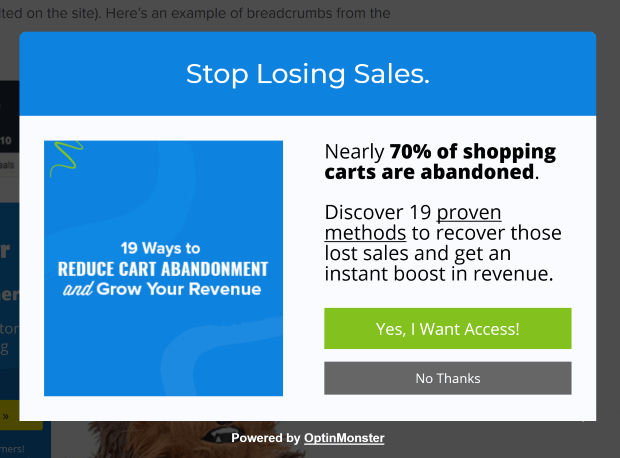 Through this eCommerce lead generation guide, we’ve talked about ways to generate leads with lead magnets and gated content. These are all content marketing techniques, and there are more ways you can use content marketing effectively. One of these is guest blogging. Learn more in our guide to guest blogging. People who follow you on social media are already interested in what you have to offer. That’s why it’s a no-brainer to convert those social followers into leads. Sure, you can add a link to your latest campaign to your social media bio, but that’s pretty non-specific. To get the most of your social audience, you’ll have to advertise. All the major platforms include ads, and collect information about your audience. That means you can target social ads specifically to the demographics and audience interests you most want to attract. For example, fashion retailers can create different ads for men’s and women’s fashion, and for different age groups and products. 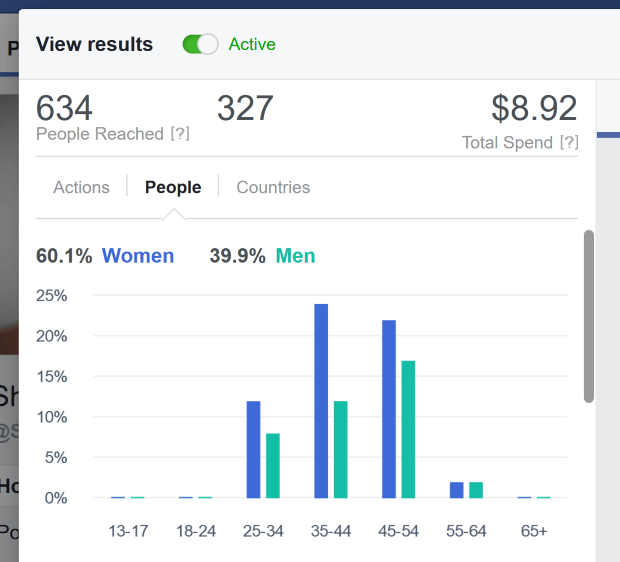 Facebook makes it particularly easy to create social ads. It’ll tell you when a particular post is doing well, and suggest you boost it. Then you can choose your audience, your duration and your budget. After a short approval process, your ad is live. 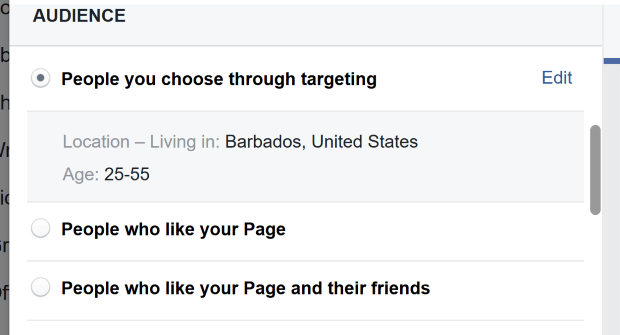 Facebook will collect data on how the ad’s performing so you can always tweak settings for next time. Now you know how to generate leads for an eCommerce website, check out some of our other eCommerce guides. You can learn how to create an eCommerce business plan, how to optimize your eCommerce site for more revenue, plus some nifty eCommerce email marketing tips. Then see our list of lead generation tools to get more traffic to your site. Or, if you’re looking for a list of lead generation plugins for WordPress, take a look at our top picks. And follow us on Facebook and Twitter to get updated when we publish our next eCommerce resource.